The Society of Gloves: Have You Watched Your Picture in a Frame Yet? 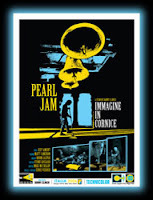 Today is the official release day for the music documentary Immagine in Cornice, and I think I'll give the DVD another spin (you can read my review on another blog). I guess this is the end of the road for me ranting about Pearl Jam and/or Eddie Vedder on this particular blog (for the foreseeable future, of course). Since my knee-jerk review of Ed's solo disc, I've listened to the album over and over. My only relevant complaint of brevity falls on the second track, "No Ceiling," as it seems to abruptly end. "Setting Forth" is incredible for its completeness and medium tempo, being all of one minute and thirty-seven seconds. The tracks lasting between two and three minutes recall the older form of 45 rpm songwriting, completeness while keeping the time short. The cover songs "Hard Sun" and "Society" are nice in length, though. Also incredible, other than backing vocals on a couple of songs and a guitar track for one song, Ed played EVERYTHING on the album! Okay, that's all I have to add to my previous review of the album.